For decades golfers have employed an incorrect understanding of why the ball flies the way it does. Science has set things straight, but many golfers remain unaware. Put another way, many instructors and famous golfers have stated that the swing path is the primary determinant of the golf ball’s starting direction. This information is wrong, and it’s slowly coming to be understood as such in recent years. Unfortunately, many golfers – famous or otherwise – and instructors – famous or otherwise – still believe these outdated and incorrect ball flight laws. Mike Bennett and Andy Plummer discuss the ball flight laws on Charlie Rose on December 23, 2009. They were not the first instructors to understand the correct ball flight laws, but they were some of the more vocal. The debate over the nature of a golf ball’s initial direction of flight is, unfortunately for generations of golfers, a relatively recent one in golf. Only since the turn of the century have instruments which can measure the moment of impact in precise detail been developed. Those instruments have given us data that contradicts the decades-old (incorrect) information about what governs a golf ball’s launch and flight. When I first started playing golf, I never considered the possibility that the ball could come off the clubface in any direction other than nearly perpendicular. It struck me as common sense. Though I realized a golf ball-golf club collision was not elastic, I didn’t think that a ball could be “carried by the path” very much in the .000045 seconds the ball is “stuck” on the clubface. Not enough to determine where the ball went, anyway. Eventually, my mind was changed. I’m sad to say that this change was not based on science but rather the fact that world-renowned instructors and players all said the same thing. “I aim my feet where I want to start the ball and I aim my clubface where I want the ball to go, then swing along the line of my feet” they said. During this phase I even went so far as to point out that billiards balls, collisions between which are almost as elastic as we see in real life, can be “thrown” off-line and be “carried” by other balls. It turns out I should have trusted what I felt was common sense in the beginning: that the clubface has a much larger effect on the ball’s initial path than any amount of “carrying” on the clubface by the swing path. Even though it’s in another plane (vertical rather than horizontal), consider which direction a ball travels when you properly strike it with a descending blow. The ball launches upward, because the loft of the clubface is pointing that way. Though The Physics of Golf shared the information years ago (the second edition is dated 1999). The information is available elsewhere too (like here and here – thanks to John Graham for those links). All of those works are fairly scientific, and though widely read and understood among the scientific component of the golf industry, the average golfer (and golf instructor) remained unaware. The late 2000s marked a turning point in the battle of current, correct information versus “the way we’ve always told people to do it.” In January, 2009 Trackman – makers of a popular launch monitor – publicly released information in their newsletter which shared the information in an accessible, easy to understand format. Again, while the scientific community – and a few instructors and golfers – knew this already, the Trackman newsletter was significant simply because of the easy digestibility. The horizontal launch angle is determined by only two parameters, the club path and the face angle. As a rule of thumb, the horizontal launch angle is 15% determined by the club path and 85% determined by the face angle. For example, assume a club path of +6.7 degrees (6.7 degrees inside-out for a right-handed player) and a face angle of -1 degree (1 degree closed for a right-handed player). This would result in a horizontal launch angle of 0 degrees (ball starting at the target line). In other words, you are saying that the face angle is by far the most dominating factor for the initial direction of the ball. Is this not in direct contradiction with the “Ball Flight Laws”? Yes it is. According to the “old” ball flight laws, the initial direction of the ball (HLA) is 100% dictated by the club path. All the scientific people in the golf industry know that this is wrong, yet still a lot of PGA professionals use the incorrect ‘old’ ball flight laws in teaching. And many PGA organizations around the world do not teach their apprentice and member professionals according to the ‘true’ ball flight laws. The science gets a bit headier beyond that and the downward angle of attack and its effect on the “true swing path” is discussed. But the key piece is clear: roughly 85% of the ball’s initial direction is determined by the clubface angle and only 15% is determined by the path. These numbers vary little. You might think long drivers, who compress (“deform” is a better word) the bejeezus out of the golf ball, flip the ratio, but they actually push the numbers more towards the face, climbing into the low 90s. In fact, the ratio approaches 50/50 (but never gets below about 55/45) when you swing a wedge at a certain speed due to the contribution of the grooves with the path. Also, with the low loft, a putter can generate ratios approaching the mid to high 90% towards clubface contribution. Nick Faldo’s advice is clearly based on the old – and very much wrong – ball flight laws. return his clubface to the same angle as it was at address and swing along his shoulder line. subconsciously return the clubface open to (right of) where it was at address and swing even more inside-out than his shoulder alignment. Shot #1 is what Nick said you should do. If Nick followed his own advice and performed #1, he’d hit the ball right into the tree. If Nick was on a golf course with no trees, the ball would start just right of the target and hook well left of it. If Nick subconsciously manipulated both the clubface angle and the swing path to produce #2, he’d start the ball to the right of the tree and hook it back towards the target – the shot he wants to play. What are you going to believe – science or Nick Faldo’s feel? Even Nick Faldo’s subconscious mind didn’t trust his feel, favoring the reality of science (or the instincts of having been a great golfer for a long time) instead! Consider a student who’s hitting a straight-fade or a straight-slice. A straight-fade starts straight at the target and then, for a right-handed golfer, peels off to the right. If this golfer visits an instructor who believes the old ball flight laws, he’s going to have the student trying to square up the clubface. After all, the instructor believes that the ball starts on the swing path, and then reacts based on the face. So the instructor will believe that the student’s swing path is fine and that his clubface is open. The reality is that this student needs to work on his swing path. His clubface is already awfully close to square at impact – the ball is starting at the target. It’s purely his outside-in swing path that’s causing the fades or slices. With arrows representing the swing path, the balls in these images will fade/slice, travel straight, or draw/hook from top to bottom. This diagram demonstrates every possible shape a well-struck golf ball (we’re not talking about tops and shanks here, people!) can have. The true ball flight laws tell us that a pull (B) is a combination of an over-the-top (outside-in) move with a closed clubface that matches the amount of outside-in swing path. The true ball flight laws tell us that a push-draw (G) is a result of an open clubface with a swing path that’s more inside-out than the clubface is open. For example, if the clubface is 3° open at impact but the swing path is 6° inside-out, the ball will start right (open clubface relative to the target) and curve left (closed clubface relative to the swing path). 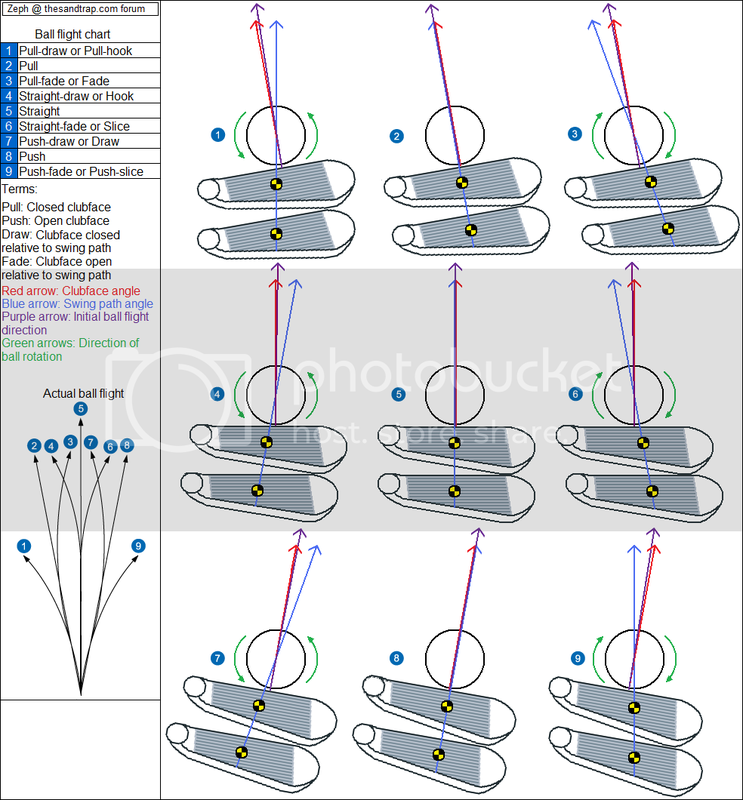 How would the old ball flight laws tell us to hit a push-draw (G)? They’d tell us to swing in-to-out while keeping the clubface square to the target. Basically, they’d tell us to hit shot D. Ouch. In the chart above you’ll notice that the straight shots – B, E, and H – are italicized. These shots are each hit with a clubface square to the swing path and are the only shots on which the “old” and “true” ball flight laws agree. I’ve also marked in bold the “good” shots: a pull-fade, a straight shot, and a push-draw. The straight shot is good for obvious reasons, but as you can see the pull-fade (C) and the push-draw (G) work because, though they start away from the target, they curve towards the target. If you’re like most golfers, having toiled under the old, incorrect ball flight laws, you may feel energized reading this. Perhaps you’ve been battling a persistent slice by trying to “release the club.” It’s a common suggestion, but if your ball starts at the target before slicing, you should have gathered that you need to work on your swing path, not your clubface angle at impact. That’s even more important if the ball starts left before slicing two fairways over. Armed with the proper knowledge, you’re going to be amazed at how often you hear advice based on the old, incorrect ball flight laws, and from whom you hear it. Magazines, television, respected teachers, and accomplished players will all dish out advice that’s potentially damaging to your golf game because it’s based on the “old” laws. The ball flight doesn’t lie. Now that you know how to read it, you can spend your time working on the right things. Photo Credits: Black and White Illustrations: Unknown Origin; Color Diagram, Screen Capture © The Sand Trap .com; Video © Golf Channel. Sensational article. Make this a sticky on the front page. Required reading for anyone who plays or plays with others. Very concise and easy to understand. As a high handicapper I struggle with squaring the face at address. The soles of most drivers want to roll the face out of square if you ground them before gripping, so I must focus on my grip being square to the club face so the club face can be square to the target at a square address. While alignment markings on heads are considered less than elegant I think we would benefit from some help in squaring the face now that we understand how important it is. An excellent well written piece. Very good work. You’ll still find among instructors that know the correct ball flight disagreements between how to help that straight fader. Some will still say face first, then rotate the whole thing around so it points at the target. The debate comes from the golfers perception. Does the golfer feel/know face relative to path or face relative to target. Depending on an instructors belief, they will attack the issue differently. The other thing coming down the pike is the fact that the ball flight does lie unless there is centered contact. Trackman has discovered that gear effect occurs in irons also. Oh, I don’t think that’s so much a lie. I think – though perhaps I shouldn’t make the assumption – that most people know the ball flight laws only work with good contact. They don’t apply when you top or shank the ball, or toe it badly, of course. Maybe it needs to be said, though, so thanks for mentioning it. I also think every decent player has hit a shot with an iron (typically off the toe I’d imagine) that draws a little more than you’d expect. So I have no doubt that the gear effect exists with an iron. I’m curious how Draw biased clubs play into this. If you’re hitting a pull slice or pull fade, won’t a draw biased driver cause you to hit a bigger pull/ or perhaps just a straight pull? I’m curious how Draw biased clubs play into this. Draw biased clubs move the center of gravity towards the heel. This does a few things: it makes it a bit easier to rotate the clubface to get it square at impact, and it moves the sweet spot so that anything hit on the center of the clubface acts like a toe-hit – giving you a bit of draw spin from the gear effect. But, to answer your question, if you come over the top, you could hit pulls or just a ball that doesn’t slice quite as much due to the slight offsetting draw spin from the gear effect (or a combination of both). So we could say that the only time the club face should be pointing towards the target is when we intend to hit a straight shot. So, feel golfers have got a big advantage over the ones following the “old rules’. I knew it. Hmm. Anyway, is it possible to hit the same shot with 2 completely different set ups if theyre the exact opposite? like an open stance and in to out SP with an open club face compared to a closed stance and out to in SP and closed face? Id give it all up to just hit it straight consistently. Great article. The Breed footage was a good find! I made myself a chart almost identical to your ‘Ball Flights for Right Handed Golfers’ graphic just a couple weeks ago. Having only been clued-in to the ‘new’ science of face vs path, I needed something visual to help me keep it straight. I second the comment that this post be made sticky on the front page of the site. It’ll certainly find a place in my bookmarks. The shot that most emphasises the path versus angle theory has to be the bunker shot, open stance, out to in swing with club face laid open but pointing at the target with a small allowance for spin on landing. I like the article and agree with it. One point I didn’t see made was that the degree of carry must alter relative to ball compression? A squash ball would stick to the club face much longer than a marble for example. I would think the marble would always travel in the direction of the club face and not curve? Good information. Where does clubhead rotation fit into the laws? You could have a square clubface at impact which is rotating closed. What effect does this rotation have on the ball flight? Uh Guys………. this is more than just “good information”. This is a “Game Changer” for all of us who have learned the wrong ball flight rules. Essentially this gives us the Right Information to use in order to diagnosis our swing flaws; it also explains to me why I cannot create Draws / Fades on command even when I am “Certain” that I executed according to the old rules….For example – I hit the tree consistently when trying the Faldo example shot! Bombastic Information! Now, I must get back to work transforming my Pull, Pull Fade into a nice Push/Draw!. While I am not sure I totally understand all that is written here, it did inspire me to play with my swing a bit today. No matter what I do I tend to square the club face at impact – fades and draws are awkward for me. Today I decided to play with my feet to try and get more consistency figuring the rules might be what is messing up things. On long irons/driver I dropped my rear foot back slightly, after aligning to the target – not away and back, but just slightly back. The result was excellent. Then on short irons I dropped the front foot back, after alignment. The ball flight and contact was great, getting through the swing was smoother. The crazy thing is the divots were a aiming little left or right, but the ball was straight on the target line as referenced by my shoulders. I guess the default line “well if the pros don’t (or do) do it then it must be the law.” Everyone repeats what they are taught, peer pressure, industry, misinformation all create limitations that may not be necessary. However, there is one thing I just cannot seem to comprehend and that’s the quote above. I just don’t get it! Is there a visual to demonstrate what you are explaining above as perhaps seeing it will make it clear? The push draw? Let me see if I can use the existing red/green/blue thing to exaggerate the point(s). Let’s assume your target is the Green E at the top of the graphic. To hit a push-draw, you’d align your clubface towards Blue H and contact the ball when the clubhead was swinging along a path pointing towards Blue I. You should get a shot like “G” – one that starts right of the target (which is roughly where the clubface is pointing) and draws back (because the swing path is more in-to-out than the face, or the face is closed relative to the swing path). In the book the “in to out” part is hitting on what Mike and Andy like to call the “back side of the circle.” So you may be able to do this from a square stance pointing at Green E.
Also, remember that the graphic exaggerates things so it’s easier to read. A 5-yard draw doesn’t require a clubface/club path difference of 20 or 30°. Realistically, most people who shape the ball a small amount look pretty square – 3° is a small angle. Yes, that’s true. You can see it with some of the foam practice balls out there, too. But golf balls all fit within an awfully small range. After all, the rule applies almost as well to a quarter swing with a wedge as it does with a full driver swing by Jason Zuback, so… that’s why 85% is the rule of thumb, with it more likely to be 90/10 than 80/20. Almost none. 45 millionths of a second is not a lot of time. We do see a change in behavior with the gear effect, but if memory serves the clubface is contacting the ball for something like five to ten times longer when you hit the ball well off-center (because while the clubhead is twisting out of the way it’s still touching the ball). Great article. I remember seeing the ball flight charts a few years ago. I use the rules to analyze my swing both at the range and on the course. What I didn’t know was the 85-15 ratio. I know that a slice/fade is from swing outside-in because it puts side spin on the ball, while a push is from having the club face open because that is the direction on which the ball starts. And the opposite, of course, for the hook/draw and the pull. And if I practiced more, my swing would be more consistent so that the theory that I know would become the reality for which I strive. Fantastic article, after a couple of readings it makes complete sense. Like Phil I had a problem understanding how an open clubface can create a draw but then I remembered all the scratches on the bottom of my driver seem to suggest the face is open at the time it touches the tee/turf and my usual shape is a push draw – How could this be – then the light switch went on. To phil just think of it like this; if the swing plane is more in to out (in degrees) than the clubface is open (as per example) it will draw – just believe. My son wisely says the path to happiness is not asking questions!! Thanks Chris, all help on this matter is greatly appreciated. I’m a golf instructor and my world has just been turned upside down! I needed to have it crystal clear before standing in front of a student again. In the space of a couple of weeks, I have gone from the conventional swing to Stack & Tilt and now this! Fortunately, the students are being very understanding, it’s the other instructors that are not too happy and prefer to remain in the dark. Phil, if you are an instructor, I’d count you among the good ones even without seeing you. Too many instructors these days are unwilling to accept that they may be wrong or that there may be a better way of doing things. Kudos to you for being open to new information. Thanks for your kind words, Erik. I’m always learning and studying the swing so I can help improve my students’ games. Although English, I am based in Madrid and nobody (including pros, both playing and teaching) appears to know the correct ball flight laws. And I only found out via your website with your articles on Stack & Tilt. Why hasn’t a bigger deal been made out of these new findings?! As embarrassing as it may be teaching the wrong things for 10, 20, 30+ years, surely any self-respecting teaching pro would switch over immediately to avoid total humiliation. Keep up the great work on the website, you have no competition as far as I’m concerned and I check in daily to make sure I’m abreast of the very latest developments. And thank God I do! According to the old way. To hit a fade you align your body towards the left of the target and aim the face towards theh target, this would produce an open face in relation with the body, and that would be the reason of the “high fade”. According to the right way, to hit a fade you wouldnt need to open the face and aim at the target, you aim the face and body left and swing inside out. So what would be the reason of the “high” fade? As I think it,in theory, a good executed fade should fly as high as a good draw, because we are not closing or opening the face. Yes – a fade that started at the target (or the tree that was in the way, perhaps) and then faded to the right of the target. No, you’ve misread something along the way. Bear in mind that when people say “stance” what they truly mean is “swing path” because, give or take, golfers make impact pretty much on the same line as their stance line. So the correct way is this: aim your stance well left, aim the clubface a bit left, and swing. The clubface is open relative to the swing path so it will fade, but the ball starts left of the target so it has the room to fade. I am 100% clear on the angle of the clubface (the ball starts in the direction the clubface is pointing), however how can you tell the swing path from the curve of the ball thereafter? Take for e.g. a ball starting right and spinning further right. It is clear the clubface is open at impact. No problems there. But it could spin further right due to an out-to-in swing path or due to the clubface being open relative to an in-to-out swing path. Is that correct or am I getting confused again? It could. All you can tell from the spin is the swing path relative to the clubface. If the clubface is 10° open but you swing from the inside 5°, that’s still a push-fade (or a push-slice). But even then, that ball won’t fade/slice as much as a ball that’s hit with a clubface that’s still 10° open but with a swing path that’s square to the target or 5° from the outside. Obviously those shots will curve much, much more. Thank you for a fantastic article! My brother and I have been swinging golf clubs since before we could walk, but just recently found ‘The Sand Trap’. Every article is very well written and you can be sure we’ll both be coming back to check out new articles on a regular basis. My only complaint is that I live in Michigan, so I have to wait a couple of more months before I can try this out! I’ve always hit a consistent draw, but whenever I tried to hit a fade, it would turn into a push-fade. This really clears everything up, so I’ll stop trying to use just my hands to hit the shot. Thanks! Is this thinking correct? Please comment on swingpath for each of these. Having trouble associating your clubfaces and swinpaths above to get the results on the colored chart. Thanks. I am having trouble visualizing what the swingpath is doing on each of these. So all shots that start left of the where you are aiming your body result from over the top swings? So, if I am over the top more than the clubface is closed (relative to target) the net result is a pull fade? (makes sense because of the spin generated) And if I am over the top less than how much the clubface is closed (relative to the target) the net result is the pull hook? (unless the clubface ends up being square to the swingpath) Thanks. The ball will always spin based on the club’s path relative to the clubface. You can swing out-to-in, for example, 3°. If the clubface is square to the target, you’ll fade the ball. If it’s 3° closed, it’s a straight pull. If it’s closed 6°, it’s a pull-draw. I think you’ve got it. If you get confused, keep things simple: the ball starts where the clubface is aimed (essentially), and curves based on how the club came into the ball along that line. Having trouble associating your clubfaces and swinpaths above to get the results on the colored chart. Thanks. Glad I read this. I was fitted for new irons last year, which was my first “lesson” in 25 years. The pro pointed out that I was setting up with my club face several degrees open (about five). And he told me with my new, slightly flatter irons, I wouldn’t need to set the clubface so open because the flatter lie should straighten out my hook. Well, they did take a little of the curve off my ball, but I found that I couldn’t hit a consistent push-draw unless I set the club open to the target line. Once I went back to opening up the clubface, my push-draw ball flight became much more consistent. I love it. I get all tingly just thinking about the day Manzella rolls out the ME PLANE! Just think, he just invented the game of golf 5 years ago.! If my memory serves me, didn’t Jack Nicklaus’ book Golf My Way describe the way to hit fades and draws in a similar manner to Faldo’s video lesson (i.e., pointing the club face at the target and swinging along a different path)? And how many current amateurs (and pros?) learned how to play using Jack’s book as a guide? Amazing to think how many trees were hit attempting to escape from trouble using the old view of cause and effect (and we just thought we didn’t execute!). aim your body to the left part of the hole, an the clubhead toward the target, that way is an intelligent move he says. because if the ball goes straight it ends up left to the hole on the green, if it fade nicely it goes directly to the hole, and if fades too much it will end up slighty right of the hole. Funny how he was well known by the high fade when he actually didn’t know how he was doing it. This question is regarding the “push draw” shot. Do I set up square to the target or closed? It sounds like we set up square and swing inside out. This question is regarding the “push draw” shot.Do I set up square to the target or closed?It sounds like we set up square and swing inside out. SideWinder, it depends on the person. If you line up closed you might more technically be hitting a “straight draw,” but it’s irrelevant what you call your shot so long as it’s curving towards the target. Funny… that’s what a golf instructor who doesn’t know anything says to people. This is one of the best articles written on this subject. I understand it completely and am in total agreement with it. It’s exactly how I play all my shots. And to add…It’s like shooting darts, I’m totally TARGET FOCUSED and it’s like my swing path and face angle will be in effect of what my intention is. A fade or draw or straight (although there is no straight shot in golf) with low med or high flight. My central nervous system is programed to my intent. It is the best way I’ve found to be on target with a great ball flight. Thanks for sharing this….I LOVE IT!!! Also, with all due respect to Dr. Gary Wiren, he may have been somewhat correct in the PGA teaching manual, but he contradicted himself pages later and sat idly by for 20+ years while people definitely got the ball flight laws wrong. Bit too late to try to clear your name now, Doctor. To me it seems easier to swing down the body line(shoulders, hips, feet), than it is to go against it. I think I can be brief about the push draw and the pull fade. The push draw is a inside out swing path where the clubface is open to the target, but closed to the swing path. The pull fade is an outside in swing path where the clubface is closed to the target, but is open to swing path. The information you have “disclosed” is not new! This is the same information the PGA has used for 35 years. Maybe, you, and your fellow Professionals should have paid attention during PGA Business Schools. What you have shown and explained in this article, IS EXACTLY what was taught in the PGA.. The PGA has ALWAYS taught, the nine ball flights, why those flights occur, (3 paths, combined with 3 club head positions at impact) and the reasons those flights occur. There are endless variations of the flights of a golf ball, but the basic paths are simple geometry. Clubhead position at impact combined with path. How one gets to impact is personal preference. (ie; Trevino does it different than Nicklaus, who does it different than Hogan) There is no correct swing, but a better accepted method is taught. I am a LIFE MEMBER OF THE PGA. I go back to the original PGA Business Schools. (1976) You have just now “discovered” what “old school shotmakers” all new. GL Teaching your new found, old school knowledge. Mike, your hostility is unwarranted. First, the PGA has not used “this same information” for 35 years. The Teaching Manual from 1990 is muddy at best and does little to clarify. I’ve not taken any “PGA Business Schools” as I’m an apprentice, and I’m not sure what anyone would have learned in them either. Yes, the PGA has taught the nine ball flights, but they’ve been absent or confused on what causes them – path is not responsible for the starting direction of the ball. The PGA Teaching Manual never said that – as I said above – but an incredibly high percentage of PGA Teaching Professionals believed it and based instruction on this false belief for decades. With all due respect to the both of them, Trevino and Nicklaus have nothing to do with this conversation, unless somehow, the rules of physics ceased to apply to them. I have some ocean front property in Montana I want to sell you! I get real tired of hearing how this “new” era, thinks they know so much. Why is golf in a major down turn, if this era of “PGA” initials is so good. There are more people available to play the game – perhaps, the new era of PGA initials is just not as good as they are told (and think) they are. The path the club travels (three possible, with infinite variations), combined with position of the clubface at impact, (three) dictates ball flight (nine possible, infinite variations). How can you, as a “apprentice”, who has limited experience, with admitted no training, know so much about ball flight, and the history of the PGA? Just curious. Won some tournaments have you? Can you create and demonstrate all nine ball flights? Next time on the practice tee, please show a inside out swing path with a open clubface and tell me the ball can start LEFT, or a outside in swing path with a closed clubface and the ball will start to the right? Call me when anyone can do such! I am in the PGA, my number is available. The PGA has become a “lost” organization, more intent on creating ‘clerks’ for desk jobs for leasing organizations golf facilities, who has allowed the PGA initials to become meaningless. The PGA in allowing a bunch of incompetent 80 plus shooters, into the PGA organization has contributed greatly to the down turn in golf with these 80 shooters apathy and lack of knowledge of the game of golf and the PGA. Do people who take lessons from you, actually LISTEN, to your type of nonsense? Can you demonstrate for your “pupils” your “theory”? There is NO CORRECT SWING IN GOLF! The difference in swings from Nicklaus, Palmer, Trevino, Hogan are immense. Most all of the “Hall of Fame” golfers swing differently. Are you teaching the “correct” swing, “perfect positions” throughout and how important “equipment” is. Keep drinking the Kool-Aid, the game of golf (with the changing ball and equipment) and the PGA have become a sad joke. What’s so wrong about what was said there? Path is anywhere from 1% to about 20% of the starting direction of the ball, but it’s not “responsible.” The piece that’s most responsible? Where the clubface is pointed. You’re the only one coming in here assuming this. Understanding how a ball flies or why it flies the way it does is something I consider to be fundamental to good instruction. If you can’t get that right, you’re hampering your ability to give proper instruction and you’re hapering your students. I’m not sure what you’re talking about here, Mike. If by “struck or thrown” you mean the path of the clubhead, you are wrong. If by “struck or thrown” you mean “the ball’s starting direction is much more a matter of where the clubface is pointing at impact,” then good for you – you agree with me and the physics of the known universe and got it right. I have won some tournaments, Mike, but that’s beside the point. This stuff is physics. A guy who has never held a golf club can understand this. Absolutely. I understand how the ball flies the way it does. And Mike, how far along I am in the PGA has nothing – NOTHING – to do with my ability to teach. Again, the PGA is not helping me to learn how to teach. Why would I show you something I’ve never claimed can occur? Were you able to read and understand what was written above? Nobody would tell you this was possible for a right-handed golfer. I think the PGA is glad to have me, as I’m none of those things. Your ego, that YOU KNOW MORE THAN OTHERS and have discovered a “secret” to ball flight is simply a over grown. How long does the ball “stay on the clubface” (depends on clubhead speed)? The PATH the clubhead is traveling IS the path the ball starts, the “english” caused by the path, combined with clubface position at impact (grooves) is what creates the spin and allows the golf ball to curve in flight. You sir, CAN NOT demonstrate what you are PREACHING, absolutely impossible. Your self promoting, I am important, purchase my voodoo, ego, that you know something that no one else knows or very few(or everyone has wrong but you) is shown throughout your post. You have the secret to golf physics (which you are unable to demonstrate) and ALL before you who are teaching golf are wrong! Erik – your “I am important listen to me ego” makes no sense to anyone who can create and control a golf shot – NONE! Your quote and position: “path is not responsible for the starting direction of the ball” is wrong and you can not demostrate what your are selling. a inside out swing path with a open clubface and tell them the ball path can start LEFT, or a outside in swing path with a closed clubface and the ball path will start to the RIGHT? (yes, for a right sided golfer – not right handed, one can play from the left side and be right handed, like Mickelson) All work off a “target line” – otherwise, alignment would be OB! I know more about how the ball flies the way it does than a lot of PGA instructors. I’d say the majority, but fortunately many are improving their knowledge and accepting the physics, so it may not be the majority anymore – one can only hope! They’re wrong. I – along with thousands of others – am right. It’s not ego, it’s simply a matter of fact. It’s a knowable thing. You can’t be “better” at it – you can simply have it “right” or “wrong.” You can “understand” the facts or “fail to understand” them. It actually doesn’t depend as much as I’d guess you think it does. It’s 400-450 microseconds, and again, it doesn’t vary anywhere near as much as you might think. Thank you for clarifying your position, Mike. What I’m about to say is not ego: you are wrong. The PATH the clubhead is traveling IS NOT the path the ball starts. It contributes, on average, about 15 percent of the ball’s starting direction. To put this in figures for you, if we have a clubface aligned directly at the target at impact (horizontally), and we swing the clubhead path 10 degrees to the right… The ball will start roughly 1.5 degrees to the right of the target and wind up well to the left of the target. Also, it’s quite easy to spin a golf ball from a clean, dry lie without any grooves on the clubface. I can absolutely demonstrate the nine ball flights. It’s relatively easy to do if you understand what causes the ball to fly the way it does. I’m sorry that you feel that way, Mike. Please do some research. If you’re still instructing, your students will benefit from your improved knowledge. Again, it’s not ego – it’s simply a matter of fact. As I stated, next time on the range, show anyone that can follow, how a inside out swing path with a open clubface and tell them the ball path can start LEFT, or a outside in swing path with a closed clubface and the ball path will start to the RIGHT? Did you not read the post above? I don’t know how you’re getting that I’m saying that scenario is possible. It’s a misunderstanding on your part if you’re thinking that I’m saying that those shots are possible. And Mike, if you cannot be polite enough to discuss this in a friendly manner, no further comments from you will be published. This is something Trackman and Dr. Wiren agree on, face determines 75-90% of start direction based on club. Note to self…… DO NOT take lessons from Montana Mike. Ever! If the blind fool can’t see what direction the ball starts relative to the path in this video, he should give up his PGA life membership! Physics, high speed cameras, and radar can’t be fooled like your mind has Mr. Montana. As a teenager I read Nicklaus’s books and have had this wrong idea in my head until last week. I was reading Dave Pelz’s book “Damage Control”, and while he is not a full swing teacher he mentioned that we’ve had it all wrong all these years and that the angle of the club face at impact has far more to do with the initial direction of the shot than the swing path. I was very happy to find this article and confirm his statements. What I struggled with while reading this was the concept of closed and open because it seems these terms are discussed as being relative to the body alignment. That’s why a “3 degree open” can produce a draw: it is only open when compared to the body, but it is still closed relative to the path. Once I came to terms with that, the rest of it makes sense. So my question becomes why would you choose the Push-Draw and Pull-Fade as good shots? I understand they both curve back towards the target, but aren’t they still indicative of poor swing path? In order to master them and be able to work the ball, this would require me to learn three swings instead of one! Of course, this could be a completely personal thing. I think for me I would rather have a single swing path (in-square-in) and use my grip to change the clubface angle at impact. This would mean always using the “Green” paths in the diagram, so I would aim right for a draw and left for a fade. On the surface it sounds no different, but from a path perspective it is completely different. My reasoning here is that I only have to master a single path: in essence I can use the same swing for every shot. Am I wrong or does this approach make sense? A push-fade (Lee Trevino), a pull-draw (Sam Snead), and any other golf shot can be a good shot if it’s played for and finishes “at” the target. Also, a “push-draw” can be “pushed” four yards and draw only four yards. It’s very easy to turn that shot – without a change to your swing – into a small push-fade simply by lining up more to the left and opening the clubface even more. If your normal swing path is +2 with a club face that’s +1, simply open the clubface to +3 and aim -4 and you’ll get a push-fade. Not a big change. So really it doesn’t matter what your swing path is as long as it is consistent and repeatable. It still ultimately comes down to the relationship of the clubface angle to the path. Question. If you have an in – square -in (staight) swing path and you strike the ball with an open face, then surely what you have done is simulated an out to in swingpath reletive to the initial push (right direction of the ball. Therefore the ball will start right and then spin further right? So that means that H (the push) is infact a draw creating swing path with an open face? H is a push. Face is right of the target, path is right of target, face and path “square” to each other. If you have a “straight” (at the target) swing path, and the ball is struck with an open face, that’s shot “I”. The “new” thinking is that the ball starts somewhere in between the clubhead path and the clubface direction? Hardly revolutionary. The Jim McLean video posted above shows a super slow connection like a teeny chip from the fringe. The ball just bounces off the face, of course. A bit more speed brings the direction of the ball back towards the clubhead path. So basically everyone is agreeing with everyone else on this and just wanting to argue. A bit more speed brings the direction of the ball back towards the clubhead path. No. People aren’t agreeing. Brandel Chamblee has it all wrong in this video, which spurred #chambleegate: http://youtu.be/j2mEclM1OiQ. The ball never really starts where the path is by more than about 25%. 75 – and typically more like 85% – of the ball’s initial direction is determined by the clubface. Please read the article again. Very few people like to find out they are wrong (and have been so for a long time); but a “Big” person evaluates, learns ands corrects himself. Montana Mike is so dead wrong here. Great article, Erik. Thanks for posting this . It will drastically improve my approach to the game. Ahh ha! So that is why I always hit the tree when trying to hook or slice around it! And also explains when I am lined up for a supposed fade and hit a draw… I never could explain that but now it all makes sense. I am very appreciative for this site and the great advice I have received. I’m in my 3rd, maybe 4th month of golf now. I hit the ball consistently every time… and its a slice… a mean one. I’ve tried everything to fix it, adjusting grip, turning hips more, moving weight forward, the works. I’ve managed to cut back on the severity of the slice, but also introduced a hook in the mean time. The information contained in this article was CRUCIAL to evaluating the real reasons behind my problem, and allowed me to better self analyze where I’m going wrong. Long story short, I noticed recently that my ball flight pattern is consistently straight early on then curve, so I began to look more closely at the path of my club head during the down swing… sure enough, out to in. The next 4 shots were basically the same result. After that, the only variations were slight pushes or pulls caused by sloppy control of the club face at impact. Loved the article! Thank you! It looks like this article is from over two years ago, but it’s really great! Thanks a ton, Erik. Erik, well stated, simple information on ‘old’ vs ‘new’. Really don’t know why people make such a big deal of all the 9 Ball Flights and the BFL. For instance, as regards the 9 flights, to my mind the entire ‘pull’ group is redundant. Why have a clubface aiming way left and a similar path. Why not simply aim left of target and hit it straight!!!! The LPGA Teaching & Club Professionals Division has simplified the Ball Flights by defining them as the 3 PLAYABLE BALL FLIGHTS – who cares about the rest! i)straight ii)push draw iii)pull hook – they are the ONLY ones which end up on the target, and I do think we’re all trying to play golf. As regards the 5 Ball Flight Laws. In physics we define a basic or fundamental quantity ( eg. distance, time, mass) and a derived quantity (based on two or more basic ones – eg speed is distance divided by time). So, can you or any readers think of any situation in which, given an in-to-out, shallow path with a square clubface, the club will NOT make center contact? Therefore, centeredness need not be a LAW! Similarly, with the ‘old’ Laws, one was supposed to aim the face to target and swing in-to-out for a draw. With the ‘new’ Laws one aims the face a bit right and makes the path a bit right-er (excuse my use of a non-word), so, basically semantics? It’s all in the degree of rightness and who’s actually taking a protractor out to the course. Now, if only you or any of your readers would try a swing (SPAM REMOVED) that is GUARANTEED to arrive at the ball from the inside and at a shallow angle, resulting in a fairly straight flight with a short club and a baby-draw with the longer clubs, you wouldn’t care tuppence for the BFL ever again. (Of course a modification exists for a fade). Erik’s information is transformative and, as a mechanical engineer, the physics make perfect sense. Rather new to golf, I keep hitting either the “B”, “F” or “I” shot. Now I realize they are all caused by the same out to in swing and only vary by club face position. “B” is a closed face, “F” is a square face and “I” is a open face. Finally a clue as to what is happening and a path forward, pun intended. Andrew’s image is very useful as well. It shows the combinations that make the 9 flight paths in detail.